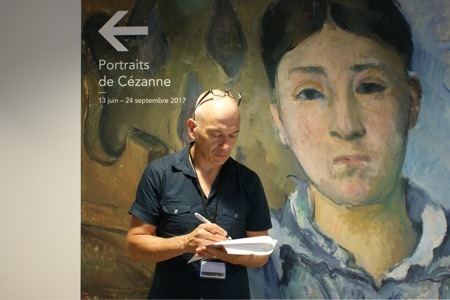 EXHIBITION ON SCREEN will welcome in the new year with the release of Cézanne - Portraits of Life, a brand new documentary exploring the life, art and legacy of the “father” of modern art, Paul Cézanne. Produced by EXHIBITION ON SCREEN, the film series dedicated to bringing world class art and artists to cinemas worldwide, Cézanne - Portraits of a Life is based on an exhibition of Cézanne portraits that has travelled from the Musée d'Orsay in Paris, to the National Portrait Gallery in London and finally the National Gallery of Art in Washington DC. Over his life Cézanne painted almost 1000 paintings, 160 of which were portraits. The exhibition, billed by art critics as ‘once in a lifetime’, brings together - for the first time - fifty of these portraits from private and public collections all around the world. These portraits provide the backbone to the moving new cinematic film. As well as offering an unprecedented level of insight into the exhibition, the film features interviews with curators, art experts and his great-grandson Philippe Cézanne. The film, shot in 4k, also travels to Cézanne’s home and studio in Provence and by including correspondence from the artist, it successfully sheds new light on the life and work of this hugely influential artist.